The best time is always now! Yes it’s now! Therefore, “Reach Out” before it’s too late. We’re extremely delighted to be hosting the Hare Krishna Convention once again this year for the eleventh time. The Temple of Devotion and Understanding (TODU), Seberang Jaya is ready to open their doors to welcome you on the 31st of Aug before we send you back home on the 3rd of Sept. The #HKC11 will be taking place for four consecutive days again this year but definitely with lots of improvements and surprises to fulfill all your needs and expectations. Yes, this time with more roaring yet melodious Kirtans, more delicious and finger-licking good Maha Prasad, more beneficial and knowledgeable seminars and not to be forgotten the best of entertaining and fun-filled Krishna conscious activities for all. Yes, that includes your children and kids who’re within the age range of 4 – 12 years old too. Worry not because we’re here to look after your kids throughout the convention. That’s definitely sigh of relief, isn’t it? So aren’t you excited? But that’s not all yet. If you ever wanted to meet all the spiritual leaders under one roof, here’s the chance. To name a few of our main guests, we have HH Jayapataka Swami Maharaj, HH Bhanu Swami Maharaj, HH Swami Bhakti Vigna Vinasa Narasimha Maharaj, HH Bhakti Vinode Swami Maharaj, HH Bhakti Mukunda Swami Maharaj and many others. As we say the Golden Opportunity only knocks the door once, grab this chance to receive our gurus’ endless mercy and blessings. Due to the huge success of last year’s #HKC10, this year we’re looking forward to have at least a minimum of 1500 devotees and well wishers joining us. So what are you waiting for? Block your dates now and book your accommodations as soon as possible because “Reach out, The Best Time is Always Now”! 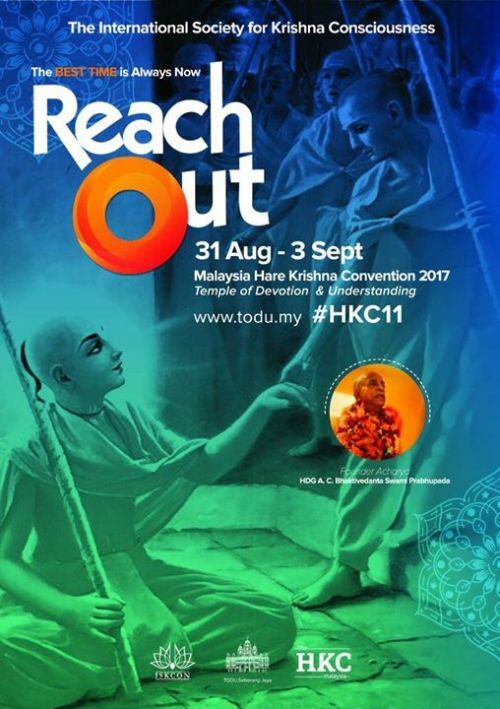 For more details , kindly click on the link (www.malaysianhkc.com) or you may write to us at info.nationalconvention@gmail.com. We will be happy to assist you anytime to ease your journey for the convention. Keep your excitements rising till we see you soon.